I’m going to start by telling you what I don’t like about “Photographing the Lake District” and that’s the size and weight of the book. The book’s printed on excellent quality paper but this makes it heavy. It’s physical dimensions also make it just that bit too large to carry with you on a shoot. This is a real shame because the quality of the information is excellent. If you want a book to use as a desk reference to research the Lake District, this book’s a great option. 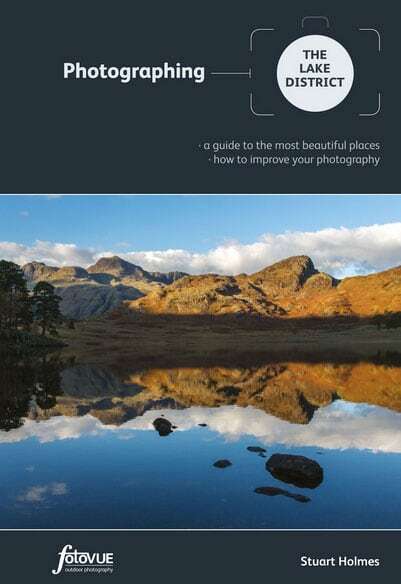 If you want a pocket-sized field guide, then consider “The Photographers Guide to the Lake District” instead. Photographing the Lake District divides into geographically areas to help minimise travel. Within these it covers 69 great shooting locations. There’s also several other “Cultural Locations” listed, which can make for interesting alternatives when the lights poor. Or perhaps if you just fancy a change from the usual landscape photography. Each section starts with a brief description of the area and a map showing the main locations. But it’s when you turn to the location description pages that the book reveals itself. There’s a wealth of information for each location including description of different viewpoints. In addition to the viewpoint information you will find very precise location and access details. A nice touch was the very useful “best time of year to shoot” information for each location. To the rear of the guide you will find several sections describing techniques. At first, I questioned the value of these but then I found they related to the location descriptions. Based on this I will accept that they are a valuable addition although they further increase the weight of the book. Also at the back of the guide you’ll find a very useful summary table. This helpfully contains details of walking times from the parking to the locations. Most usefully there are driving times from main towns to the locations. This is a huge help when you’re trying to navigate to maximise shooting in the changing light. In short, this is an excellent guide filled with information. It covers most if not all of the Lake Districts best photography locations. Just buy it and use it, you won’t be sorry.